Us Conductors: a literary event! 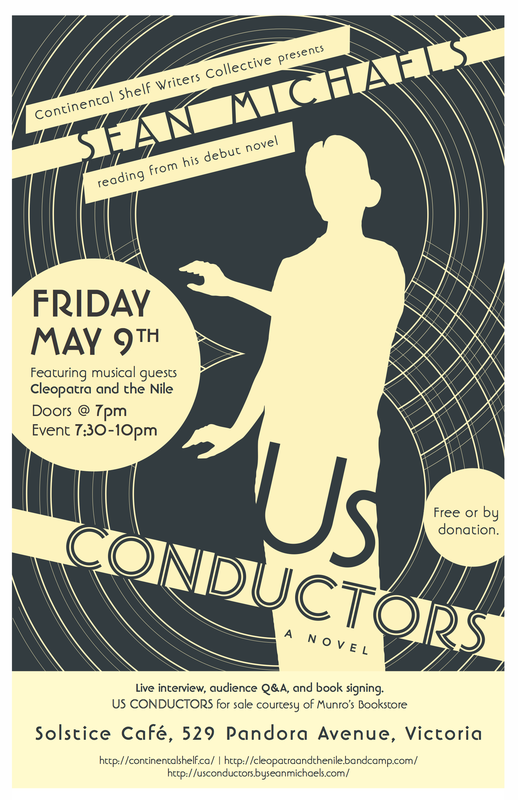 Continental Shelf Writers Collective presents Montreal author Sean Michaels and local theremin art-pop band Cleopatra & the Nile. Sean will be reading from his debut novel, ‘Us Conductors’ – historical fiction inspired on the stories of Lev Termen, inventor of the theremin, and Clara Rockmore, its greatest player. Join us for a reading, onstage interview, audience Q&A and book signing, with copies of ‘Us Conductors’ on sale courtesy of Munro’s Books. There evening will be capped off with a musical set by local theremin enthusiasts, Cleopatra and the Nile. Come conduct with us. Doors at 7, reading at 730. Over by 10. Free or by donation. Want to know more? Check out these links; we’re internet famous. Born in Montreal in 1982, Sean Michaels is a national magazine award-winning writer and music critic whose work has appeared in the Guardian, McSweeney’s, the Walrus, Pitchfork, the Believer and the Globe & Mail. He founded the unusual musicblog Said the Gramophone in 2003.